How do I connect a UPS to D-Link DNS-726-4 SecureCenter 2-Bay Network Video Recorder? 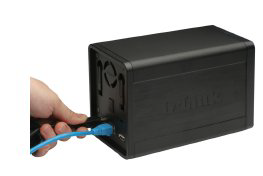 If you have a UPS that you would like to use with the D-Link NVR, you may connect it before powering the unit on. Step 1: Connect the USB cable from the UPS to the port on the back of the NVR. Step 2: Connect the power cable to the UPS. (Ensure that the UPS is plugged in and receiving power). Note: To turn off the NVR, simply push the power button for 5 seconds. The power LED will blink and the NVR will turn off after a moment. Step 3: Attach the external power supply to the DC power receptacle located on the NVR’s rear panel (labeled DC12V) and connect the other end to an AC power outlet. 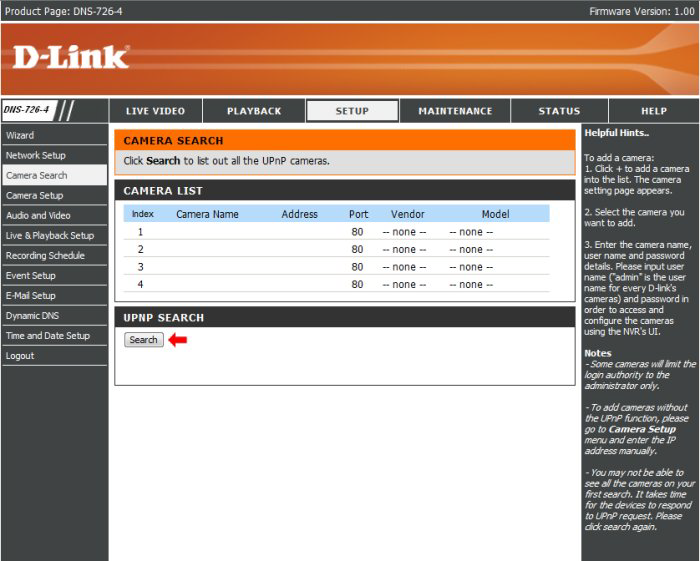 Step 1: Log into the D-Link DNS-726-4 and go to Setup > Camera Search. 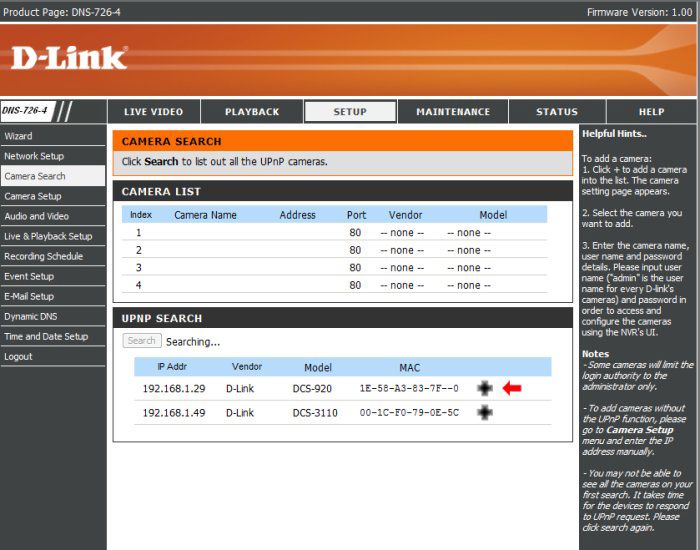 Step 2: Click the Search button to search for UPnP cameras. Step 3: The system will list all the available cameras at this moment. Click the + icon to add this camera into your camera list. Step 4: After clicking the icon, the camera setting page will pop-up. Click on the camera that you want to add. Step 5: Enter the camera name, user name, and password of the camera. Some cameras will limit the login authority to the administrator only. 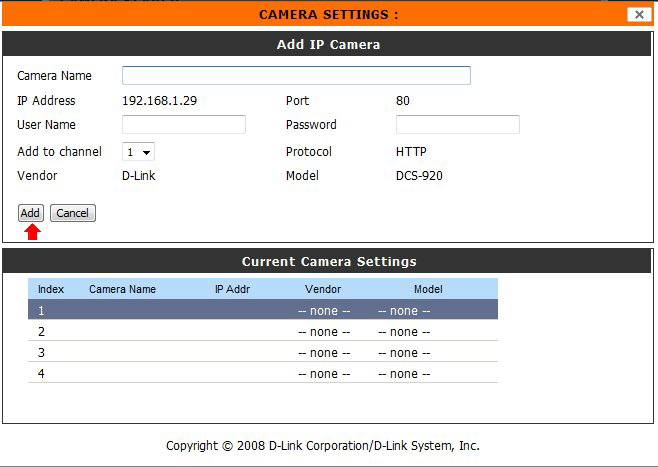 To add cameras without the UPnP function, please go to the Camera Setup menu and enter the IP address manually. You may not be able to see all the cameras on your first search. It may take a moment for the devices to respond to the UPnP request. Please click Search again if cameras are not immediately displayed. Step 6: Click the Add button to add the selected camera. Step 7: After clicking Add, the updated information will be displayed in the Camera List. Step 8: Repeat Step 2 through 5 to add other cameras into your list. How to add D-Link DNS-726-4 to the Multi-NVR Viewer Application? Step 7: Check the Save Password/ Auto Login option (optional). Step 10: Click the OK button. Note: If using the Multi-NVR program remotely be sure to open port 5150 in your routers firewall for the DNS-726-4. 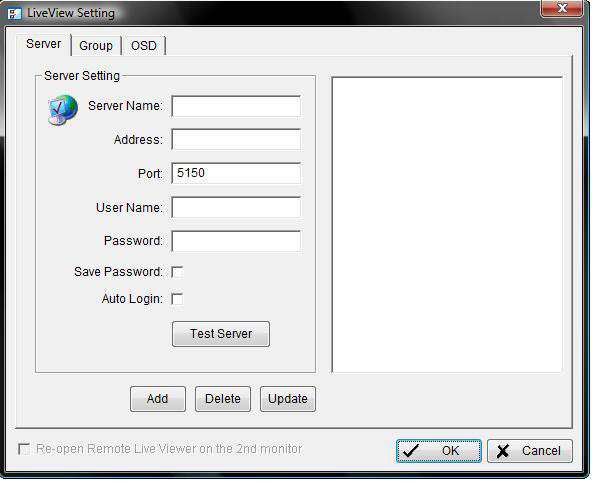 This can be done by creating either port forwarding or virtual server rule. Step 5: Highlight the camera(s) that you would like to add into this group and then click the button. Step 7: Repeat step 1 through 6 to establish other groups. Step 8: Click the OK button. Step 2: Click the Group tab. Step 3: Click the group which you would like to modify. Step 4: Click the Delete or Rename button to remove or rename that group. Step 5: Repeat step 2 through 3 to modify other groups. 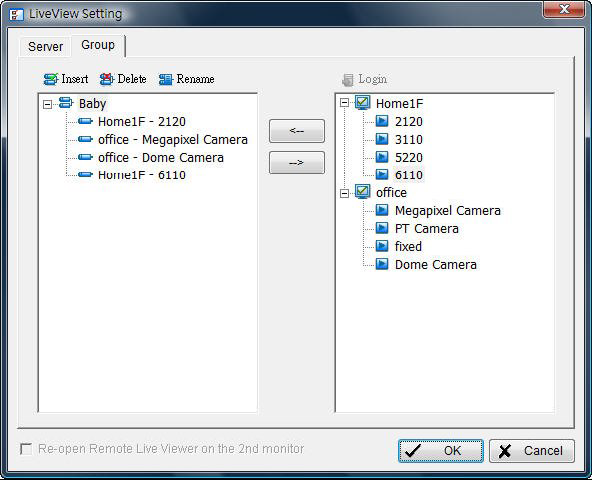 Step 1: Click the unit you wish to access in your remote server list. Step 2: Click the Log In button to access your unit. Step 3: Select the camera(s) from the camera list on the right, and then drag it to where you wish the image to be displayed.